Catch Mo'Fone in a special "Drummers up Front!" show with Alan Hall's Ratatet and Dillon Vado's Never Weather at the California Jazz Conservatory on Friday, April 5, 2019! Advance tickets recommended! All 3 drummers will be leading a follow-up workshop called "Groove Making and Leading From Behind" at the Jazz School on Sunday, 4/7. 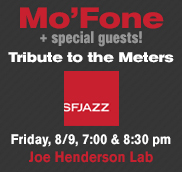 Mo'Fone will be returning to SFJAZZ to play a tribute to the Meters at the Joe Henderson Lab on Friday, Aug. 9th, along with some special guests! Get your tickets now!! 'Fonology, Mo'Fone's critically acclaimed 3rd album, reached #3 on the Roots Jazz Chart! Check out loads of reviews of all three Mo'Fone albums, along with radio interviews and live performance reviews.